I have always had difficulty with Anthuriums, and this one is no exception. It was only a few weeks ago that I managed to free it from an infestation of spider mites. Then today, I noticed that the plant was looking a trifle lackluster, and discovered that scale insects had moved in on the territory the mites had left behind. Aargh! I actually considered just giving up and throwing the plant away, rather than go through the whole treat-quarantine-keep-my-fingers-crossed routine. 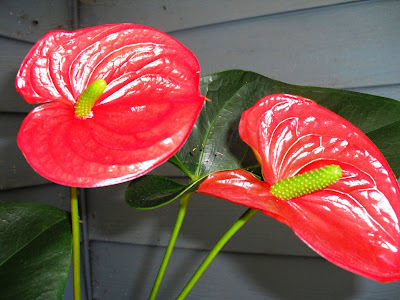 But, I decided that I must keep an Anthurium alive for more than one year, if only through sheer force of will. 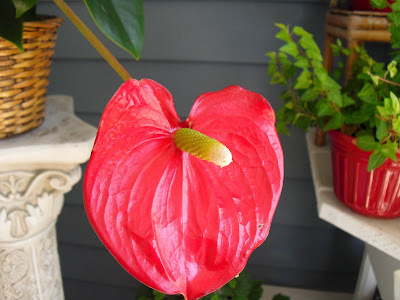 I once had an Anthurium andreanum 'Arizona' which lasted for just about a year. It even rebloomed, but shortly after that it declined and just sort of petered out. Anthurium andreanum 'Oklahoma' flowers. The first picture was previously posted in compressed form, the second is being posted for the first time. *I realize that I am probably stretching the definition of "macro" a little bit. Still, these are two of my very favorites among all the pictures I've taken of my houseplants, and opening them to full-size (two clicks) is a different experience from seeing them reduced to fit within the blog text. Was the plant inside or outside when it got the mites/scale? I've had occasional problems with spider mites, but usually only on plants that were both in significant direct sun and near other plants that were seriously infested. Outside may be a whole other kettle of stories, though. It was indoors. It only spent a few days outdoors right after I bought it last year, (when the pics were taken) otherwise it has spent the year indoors. It was in a spot that was probably too hot and sunny, but nothing nearby had/has a noticeable infestation. Of course that means nothing, since mites can go from zero to overwhelming in a very short time. The basic problem is that it got shoved into a bad spot and neglected. I have to face the sad truth that I really do have more plants than I can care for properly.